McKinsey Managing Director Rajat Gupta (above) outlined the policy changes he believes necessary to boost India’s economic output. If implemented, he said the plan would make “Indians twice as rich” as they are now. Demonstrating the breadth of the Kellogg School’s curriculum as well as the leadership of its students, this spring’s conferences again offered extraordinary insights into management in areas ranging from social change to biotechnology. At each student-run conference, business experts join Kellogg academic leaders, alumni and students to explore cutting edge issues central to many industries. In addition, the conferences serve as both a scholarship and partnership vehicle that brings Kellogg School expertise into the business community and allows the corporate world to network with Kellogg, illustrating the synergies between theory and practice. With its theme “At the Center of Convergence,” Biotech@Kellogg explored the interaction between biology, chemistry, medicine, technology, engineering and management, and addressed how the convergence of these disciplines is transforming the health care, agriculture and manufacturing industries. Topics of discussion included the opportunities and pitfalls associated with this changing environment, the impact of biotechnology on both the health care and non-health care industries, and ethical dilemmas that surround the industry. The Kellogg Gay and Lesbian Management Association hosted the 4th Annual Lesbian, Gay, Bisexual and Transgendered MBA conference in April. Titled “Reaching Out 2002,” the conference symbolized the need for LGBT MBA students and professionals to reach out not only to each but to the wider business community. Reaching Out 2002 aimed to foster an increased awareness of lesbian, gay, bisexual and transgender issues in workplaces typically populated by MBA graduates. This year also marked the 15th Annual Black Management Association Conference (BMA). The BMA conference continued its tradition of helping attendees develop and refine management tools as well as build and leverage the Kellogg network. Through the conference, the BMA seeks to increase awareness of Kellogg among professionals and prospective students and encourage the exchange of ideas and resources among attendees. The 4th Annual Innovating Social Change Conference examined the intersection of business principles and non-profit practice by highlighting business applications in the nonprofit sector. Leading practitioners from the most dynamic and innovative nonprofit organizations in the country shared the strategies they use to run high performance for-profit and nonprofit organizations. Keynote speaker Michael Crooke, CEO of Patagonia Inc., discussed the challenges and opportunities of doing good and doing well, insisting firms can achieve both. In May, the 9th Annual India Business Conference drew hundreds of people to discuss the past, present and future of India’s corporate environment. 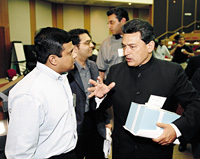 Conference attendees listened as keynote speakers — McKinsey Managing Director Rajat Gupta and PepsiCo. President and CFO Indra Nooyi — offered their assessments of how to increase economic growth in India, which they said lags behind many countries. Gupta discussed his company’s 13-point plan that recommends certain policy changes in India to boost production.